Going back to school can be an exciting yet stressful time. And with so many schools to choose from, selecting just one can be a daunting task. Now that you’ve narrowed down your field of study, here are just a few things to consider while on your hunt for the best dental assistant school. Not all schools are created equal. Be sure to check into what type of degree or certificate you are hoping to acquire and make sure that the schools you look into offer the same. Some schools will offer a degree program while others offer a certificate. Look into the difference between the two and decide which is the best for you. The type of training you receive while in school is very important to your future career and each school will teach dental assisting in a different way. While some are very similar, others will have a much different approach. When learning a new skill, it’s important to have plenty of time to practice. Students learn better and have greater retention when they learn skills in a hands on environment. Some schools offer more hands on training than others so be sure to ask about the type of training you will receive. How you will be practicing the skills you have learned? Will it be on dental models, a dummy, or a live person? And what about important skills that dentists are looking for like the ability to take x-rays and use Dentrix software? Dentists are looking for assistants that know how to navigate their way around a dental office without having to do extensive training on the job. Completing school is only half of the battle, once you graduate you will need a job. 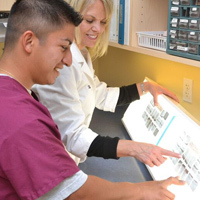 Training at the best dental assistant school is just as important as finding a job. Look for a school that offers assistance with job placement, one that will give you a great hands on education as well help with things like writing a resume and finding job openings. Once you have researched several schools and found a few that meet your requirements you’ll want to schedule a tour. This is the best way you can get a feel for what the school can really offer you. You will be able to see the campus and meet the staff. This is a great time to ask questions and get a better understanding of that schools program. As you are researching, take time to write down questions that come to you and bring that list to the tour. Express any concerns you may have at that time. Starting a new career is an exciting time, and with these tips you’ll be sure to find the best dental assistant school for yourself and be well on your way to an outstanding career. I had the most wonderfully, exciting and stressful time here. The stress was only because I’m old and had to remember how to study again. I had so much fun learning a new career and meeting new people. The whole experience was amazing!